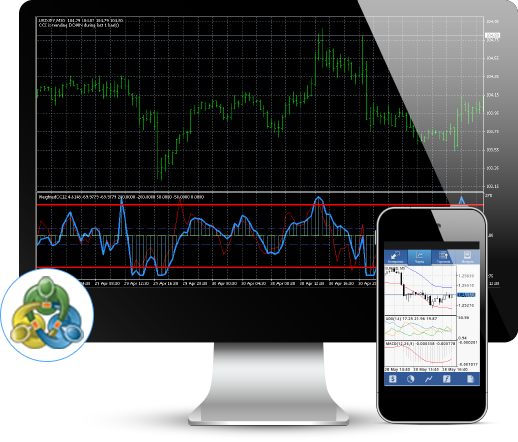 MetaTrader 4 (MT4) is the world's most renowned Forex trading platform, designed to provide traders with powerful, reliable and value-added brokerage solutions. With MT4, you will have direct market access to leading Forex, stock, index, commodity and bond markets, as well as real-time quotes, charts and alerts, and a range of advanced, commission-free trading tools*. * Please Note: Your capital is at risk. MT4 boasts impressive functionality and performance for spot and futures trading, including up to 20 times faster execution speed in Market Orders and Pending Orders. The powerful and feature-rich platform lets you trade on a wide variety of products and markets from your PC, phone or tablet – 24 hours a day, 5 days a week. MT4 allows you to easily create and add a large variety of custom trading strategies, indicators and signals for automated trading of Forex and Contracts For Difference (CFDs). Fortrade has the experience and expertise to help you achieve full trading success. We provide financial services, online trading platforms and products to 1000’s of clients in Europe and around the world. All the firm’s trading activities are carried out in accordance with the strict instructions and regulations of the Financial Conduct Authority (FCA), the financial regulatory body in the United Kingdom.